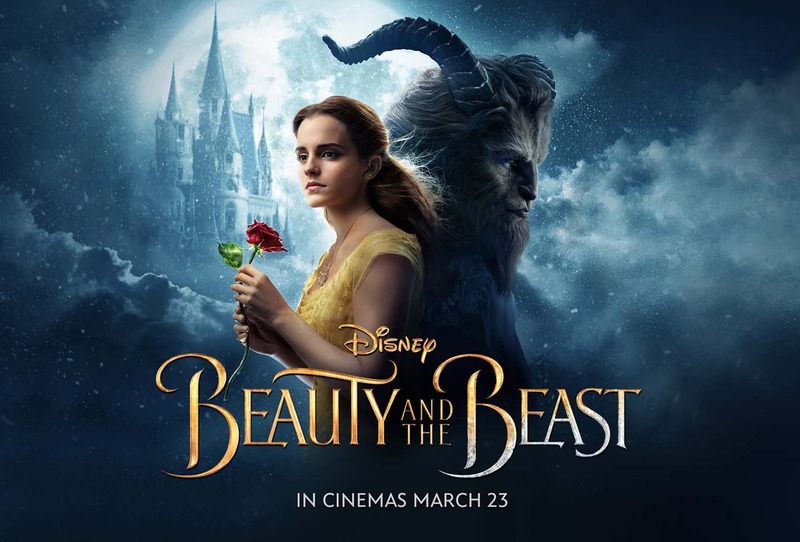 As the last rose petal falls from Beast’s forbidden rose the Beast begins to die and all the objects of the castle turn into antiques in the newly released Disney’s Beauty & the Beast. When Belle confesses her love the sorceress hears that the Beast has earned love. She releases him and the objects from her spell. The rose signifies love and life. The Beast lives because he has found love. The rose is love, without it there is no life. Love equals life. When you find love you must accept it and celebrate. Below is our example of the Beauty & Beast Invitation with Rose Motif. The rose is used to embellish this invite and also on the rsvp card. To order the Beauty and Beast card: SHOP ONLINE, email or call or stop by Hyegraph Invitations & Calligraphy located at 3 Embarcadero Center in San Francisco, Ca. You can see other designs on our Wedding Invitations Page. We can also address your invitation envelopes with Calligraphy Addressing to match your invitations. 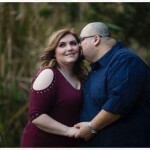 Please see our Testimonials for our Happy Clients. 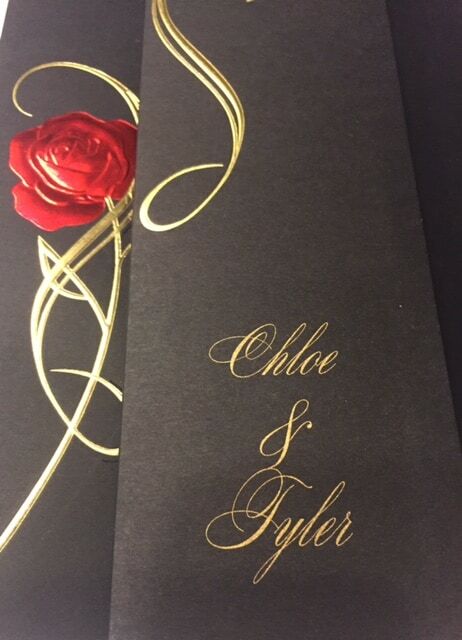 The above rose invitation is black with red and gold foil. The name of the bride & groom is also in gold foil to match the design. The inside of the invitation has the personalized details of the wedding date and reception. The above matching rsvp card is in white with red and gold foil. 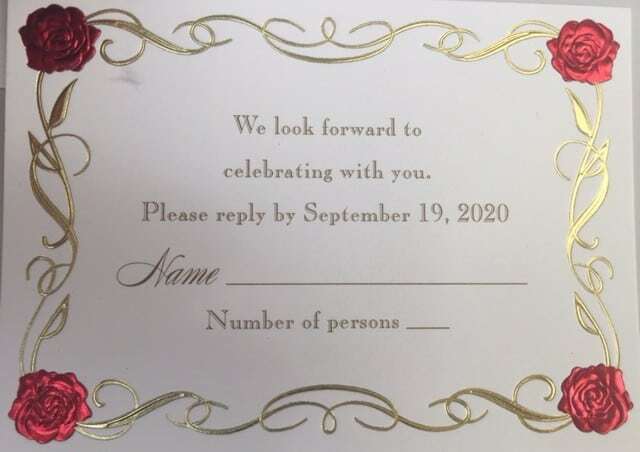 It will need to be mailed back to the wedding couple indicating the number of guests attending. You Can SHOP ONLINE or come in to Hyegraph to order! The above Disney movie is released in 2017 and is a live version of the classic animated movie which came out more than a decade ago and is a children’s favorite. 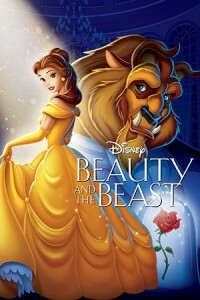 The above adored movie classic, Beauty & The Beast is the animated version with Belle, the Beast and the symbolic rose. Please see our Wedding Invitations Page and our Wedding Blog with examples of our Custom Wedding/Event Stationery. Don’t forget to address your invitation envelope’s with our Digital Calligraphy Service. 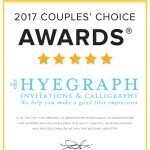 Email Us at info@hyegraph.com; Call US at (415) 626-0461; SHOP ONLINE or simply stop by at Hyegraph located at 3 Embarcadero Center, San Francisco, CA 94111. We’re here to help create beautiful invites, whether in person or via phone or email.